FOR THE NEW SYFY SERIES! Saturday, May 13, 2017 – DC TV Podcasts, which is a podcast network for multiple high-quality DC Comics TV dedicated podcasts, is expanding with a tenth podcast, as another Superman prequel series is coming to the silver screen: Krypton Podcast, the Internet’s 1st dedicated podcast for the new DC series on Syfy! Krypton Podcast is a fan podcast devoted to the upcoming Syfy series, Krypton, starring Cameron Cuffe as Seg-El, as we follow the story of Superman’s home planet years before its destruction. Krypton Podcast will be hosted by Aaron Moss (President of The Headcast Network) and Pat Sampson (Host of The Longbox Crusade). Just like some of the other DC TV Podcasts, this show will have a “Season Zero” which will kick off this summer before shifting into a bi-weekly format this fall. 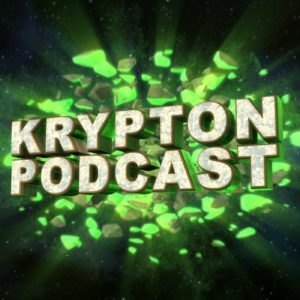 On each episode of Krypton Podcast, the hosts will provide an in-depth exploration of the comic history of some of the Krypton characters, a deeper look at Superman’s home planet in the comics along with its representation in other media, from television to movies, throughout the prequel season. Once Krypton debuts on Syfy, Krypton Podcast will become your one-stop shop for all things related to the series. Andy Behbakht, host of The Flash Podcast, will work as a consulting producer on the podcast from behind the scenes with our hosts. Krypton stars Cameron Cuffe as Seg-El, Georgina Campbell as Lyta Zod, Ian McElhinney as Val-El, Elliot Cowan as Daron Vex, Ann Ogbomo as Alura Zod, Rasmus Hardiker as Kem, Wallis Day as Nyssa Vex and Aaron Pierre as Dev-Em. The pilot was written by David S. Goyer (The Dark Knight trilogy, Man of Steel) and Ian Goldberg (Once Upon a Time), with Goyer set to serve as executive producer along with Colm McCarthy (Peaky Blinders) and show-runner Damian Kindler (Sleepy Hollow). DC TV Podcasts is a podcast network that features a collection of high-quality and popular podcasts devoted to DC Comics television series, such as The CW’s Arrow, The Flash, Supergirl, DC’s Legends of Tomorrow, iZombie, Black Lightning, FOX’s Gotham, as well as the DC Films in the DC Extended Universe and classic old-school DC TV shows! Join the hosts of Quiver: The Green Arrow Podcast, The Flash Podcast, Legends of Gotham, Supergirl Radio, Legends of Tomorrow Podcast, DC Films Podcast, iZombie Radio, DC TV Classics and Black Lightning Podcast every week for news, commentary and opinions about the comic book shows as well as DC Comics films.